Contrary to belief us freelancers don’t sit at home tapping away on our laptops wearing our PJ’s. I spend a lot of my time in meetings or visiting clients so as much as I would love to roll out of bed, jump in the car and spend the day in H&M loungewear I need to look like I mean business. You can never go wrong with a white utility shirt. It’s a staple of many of my outfits. For the bigger busted girl like me it helps to give the illusion of a smaller chest and with the addition of secret buttons, there is no worrying about gaping or flashing your bra. 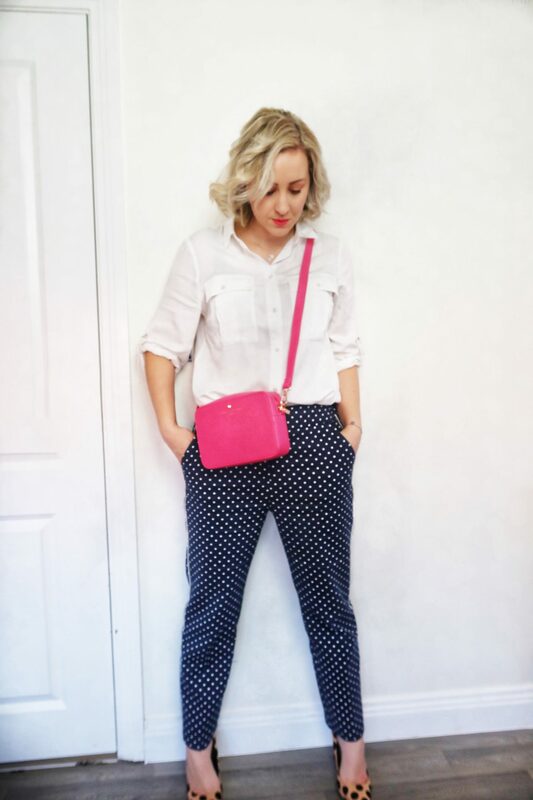 I have teamed the shirt with a pair of navy polka dot ankle grazer trousers. The contrast between the masculine tailoring and the very feminine polka dot pattern means they look smart but not too overdressed at the same time. Depending on your offices’ dress code this shirt would also look great with dark denim jeans as an alternative to trousers. Fashion World has a great selection on offer. With two kids to dress and get to school each day my working wardrobe needs to be practical so you won’t find me in heels on the school run. Instead, I pair this outfit with white Converse and my grey cashmere jumper for the school drop off and for any non-client appointments during the day. Once I get to the office or venue to meet my client I quickly change my footwear to heels. I feel more confident in heels and when most of my clients are male and over 6ft, heels help to give my tiny 5.5ft height a couple of extra inches. I always carry my laptop with me wherever I go but I tend to have a separate smaller bag for my phone, notepad and makeup essentials needed for the day. 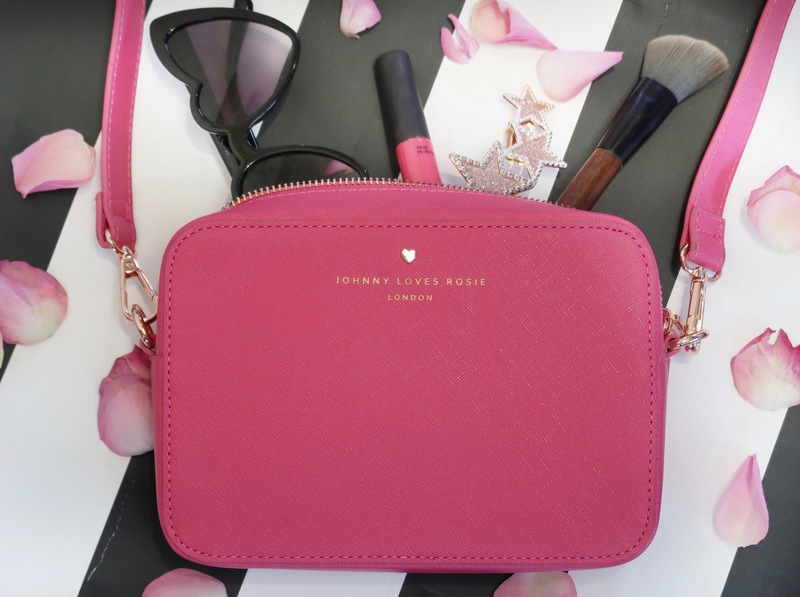 I love bold colours and this hot pink Johnny Loves Rosie crossbody bag is the perfect shade for adding a pop of colour to an outfit. 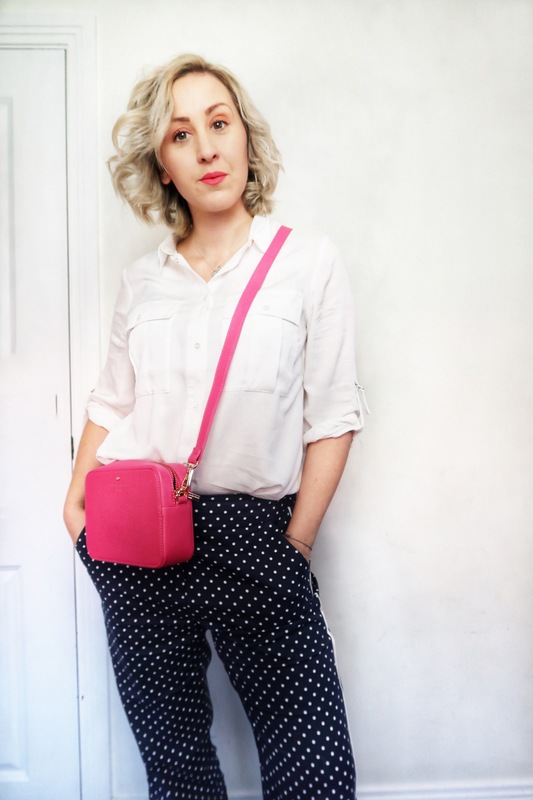 Even cuter when you can match your lippy to your bag !! So, I hope you like my freelance style and it has given you some ideas to update your working wardrobe. To order any of the items* from today’s look just click on the links below. For reference, I ordered both the trousers & the shirt in a size 12 and they are true to size. This post was a collaboration with Fashion World. The items were gifted to me by the brand for the purposes of review but all my thoughts & opinions are my own. "Red Hot Valentines Day Gift Guide For Her"